When you stroll down the winding pier as you arrive at Chaaya Lagoon Hakura Huraa, you’ll feel like it was built for just two of you! – Yes it’s the perfect getaway for couples. This cozy beach hideaway is swathed in serenity, and promises memories that you’ll both cherish for a lifetime. Hakuraa Huraa means ‘Reef above water’. What makes this reef even more special is the spectacular island resort that has been designed to complements the splendor of the island. 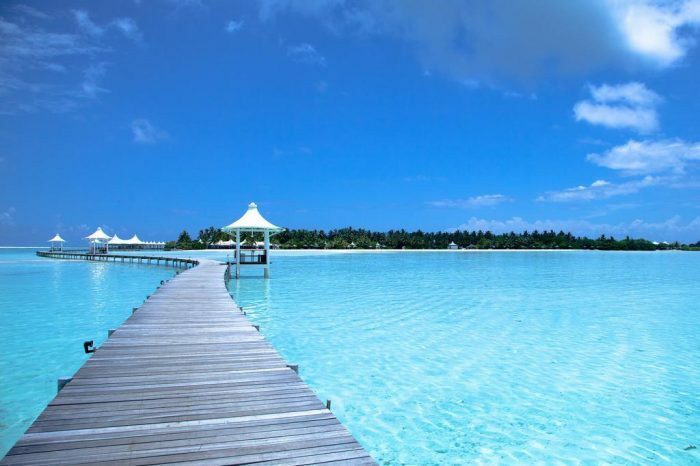 Located approximately 145km from Male and is accessible in about 45minutes on a sea plane. The Maldives is the flattest place on earth and the Meemu Atoll, where the Hakuraa Huraa island is found, is the smallest of the 26 atolls that make up paradise on earth with pure white sand, swaying palm trees, brilliant turquoise lagoon, a wealth of marine life and overwhelming sense of romance. – Island Hideaway – What better way to escape than to be alone, together?